Insomnia or sleeping disorder is quite a common condition encountered by many working adults particularly city folks who face a lot of pressure or stress at work. Hence, there are many devices invented to assist these people to have quality sleep and reduce tension in life. WakeMate, is another sleeping aid device that is created to help sleeping disorder victims to have better quality sleeping habit. 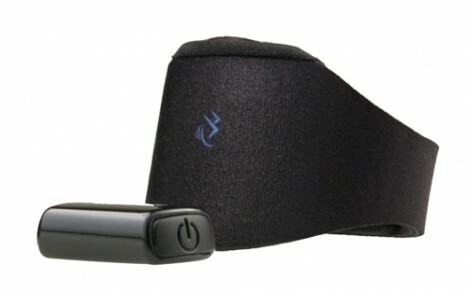 WakeMate is a wristband shaped cell phone accessory that can be worn around the wrist when users are sleeping. This cell phone accessory uses the actigraphy technology to monitor and analyse users’ sleep patterns and circadian rhythms through users’ movements. This device is connected to compatible mobile phones such as iPhone, iPod Touch, Android, Blackbery, Windows Mobile Palm, etc via Bluetooth. The data will thence be recorded and analysed. When the moment is right and the analysis shows that it is about the right time for users to wake up, the alarm in the mobile phones will be automatically triggered to wake users up. Based on this actigraphy technology, users will be alerted at so called “semi-awake” moments and waking at these times will result in minimal sleep inertia (grogginess) and maximum energy and refreshment from sleep. With the help of the sleep pattern recorded over time, users can generate a detailed sleep report and identify their own sleep problems and find a way to improve it. 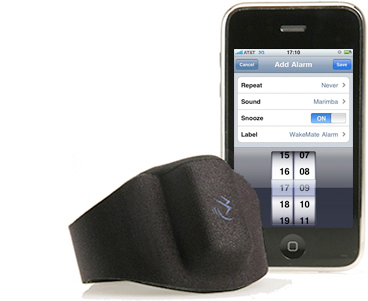 WakeMate is available for $49.99 and it needs to be used with a compatible mobile phone. Sleep victims who want to improve their sleep quality can perhaps give it a try.